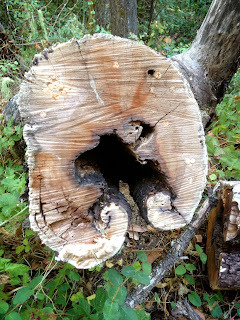 While hiking yesterday, I found this cut Douglas Fir trunk. Other than seeing elephant faces in it, the cut reveals something much more interesting. This tree was possibly struck by lightening and the center was hollowed and burned. Apparently, the tree survived the initial trauma. And until it was cut down, the tree was actively healing its wound by growing bark into the exposed wood. The healing process created the curling cambium and bark areas at the bottom. They kind of look like curled elephant trunks.